Tom and Lori Leavitt run White Oak Gourmet, which does home delivery of chef-crafted meals that customers heat and eat at their convenience. Located in Long Grove, northwest of Chicago, and serving the city’s metro area, White Oak Gourmet is a Good Food advocate, sourcing locally and regionally and working with farmers to provide customers with organic and sustainably produced meat, dairy and produce. 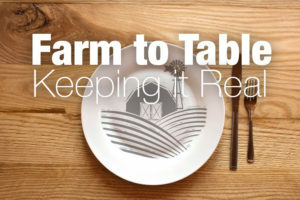 The Leavitts were thus great candidates for FamilyFarmed‘s new series, Farm to Table: Keeping It Real, and we are pleased to present their perspectives in the series’ first article contributed by a Good Food purveyor. As you will read, the effort to provide locally and sustainably produced meals is built on the relationships between chefs and producers. The restaurants mentioned in the article are all farm-to-table leaders in Chicago, and links are provided for you to read more about them. Sourcing locally is a commitment that is both rewarding and frustrating for a chef. When my wife Lori and I started White Oak Gourmet — our home meal delivery service in suburban Chicago — 13 years ago, it was quite difficult to source organic and local. It is easier now, but challenges remain. Up until just a short time ago, we had to chase down our chicken order on the truck from Gunthorp Farms, an Indiana producer of pasture-raised livestock that built its business around purveying directly to leading Chicago restaurants. As they did not deliver in our area at the time, we would sometimes have to meet the driver at Lula Cafe or behind Frontera Grill. Occasionally we have what sometimes feels like clandestine meetings to pick up orders from our farmers in the alleys behind restaurants such as Floriole, Hopleaf and The Bristol in Chicago. 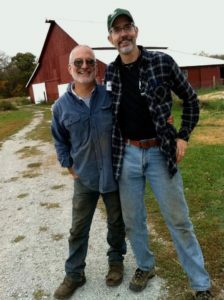 Marty Travis (left), with Chef Tom Leavitt of White Oak Gourmet, is a Good Food movement leader who works with his family at Spence Farm in Fairbury, Illinois to grow sustainable and heirloom products for the Chicago market. As a chef, I’m accustomed to calling or emailing orders to my purveyors and they are delivered the next day. To source locally is certainly not quite as easy or any cheaper. There’s no resource guidebook to get started. I really had to develop relationships with my farmers and other chefs who shared the same commitment. Social media and paying attention to the news was important in connecting us with each other. An early relationship that I developed was with Marty and Kris Travis of Spence Farm in Fairbury, Illinois (located about 120 miles south of our location in Long Grove). I was looking for organic corn to make my own tortillas and had seen a profile of the couple in a New York Times story about their farm, their relationship with local chefs and a heirloom corn variety that they’d help save from extinction. I helped set up several on farm events with Spence Farm. Marty and Kris asked me to join the board of directors of their Spence Farm Foundation, which works to promote young farmers and to help farmers transition from conventional to sustainable agriculture. 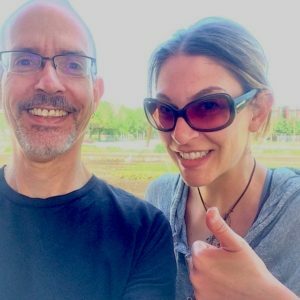 Chef Tom Leavitt of suburban Chicago’s White Oak Gourmet with Jen Rosenthal, an urban farmer whose Planted Chicago grows produce for the restaurant and caterers in the region. From this relationship, we met many like-minded chefs who were all doing their best to source organic and local products. One of the Spence Farm Foundation’s signature programs is Chef Camp, which began in 2011. This program connects Chicago-area chefs directly to the soil from which all Good Food comes. And after participating in Chef Camp 2011 , we helped found Ground Up Chicago. which works to assist new small farms with access to chefs and education on marketing and support. It also means spending time and money to pick up orders from an urban farmer, such as Jen Rosenthal of Planted Chicago, whose produce is stellar, or taking that case of lettuce from farmer Tim [Tim Frillman from Frillman Farms], when he calls to say he’s lost most of his crop to the crazy weather. It doesn’t always work out as planned, but nothing ever does. It takes a special relationship between chef and farmer to work together creatively to flow with any issues that interrupt best-laid plans. So we will continue to source local and organic despite the challenges. Every day, we work to try to live according to our values of environmental responsibility, supporting local farmers and producing clean, fresh and delicious food. Even if that means continuing to chase chickens around downtown Chicago. Lori Leavitt contributed to this article. Photos provided by White Oak Gourmet. This entry was posted in Direct Farm Marketing, Family Farms, Farm businesses, Farm to table dining, Farm to Table: Keeping It Real, Food and community, Food Entrepreneurs, Good Food Catering and Home Delivery, Good Food Dining, Good Food marketing, Good Food restaurant trends, Healthy eating, Local Food, Logistics, Organic farming, Regional food systems, Restaurants and Good Food, Sustainable food cooking, Urban farming and tagged Chef Tom Leavitt, Frillman Farms, Good Food catering, Good Food home delivery, GroundUp Chicago, Gunthorp Farms, Planted Chicago, Small farming, Spence Farm Foundation, The Spence Farm, Tom and Lori Leavitt, Urban farming, White Oak Gourmet. Bookmark the permalink.